Dr. Jabari Mahiri opened the third speaking event in the Superintendent’s Speaker Series on January 31 talking about what he likes to call a “communiversity.” He shared his belief in the exponential value of “bringing the University into the community and the community into the University” in ways that can create rich exchanges, bring progress on shared goals, and improve conditions for the future of young people. As a professor in the UC Berkeley School of Education, Dr. Mahiri shared the work he is doing with educators and students to think deeply about how we discuss identity and race. During his presentation, he used the lives of real people to illustrate the complex ways that people actually exist and live in the world. 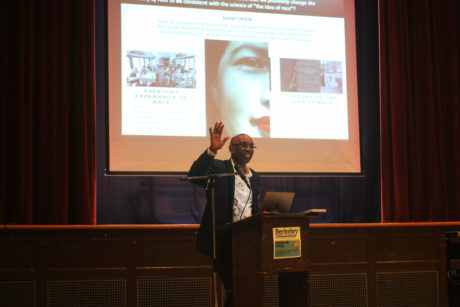 As in his book Deconstructing Race: Multicultural Education Beyond the Color-Bind, Dr. Mahiri offered lessons on how to design learning experiences that more accurately “source the experiences and identities of young people” and do away with simplistic and racist practices that categorize people and perpetuate stereotypes. Professor Mahiri says that, rather than promote and embrace the science of human variation, society has adopted a classification system that victimizes people of color and assigns privilege to whiteness. He argues that relying on the color of someone’s skin, or a simplistic categorization that attempts to define a person’s identity by race, prevents us from being able to solve the most complex problems we face as a society and to create a sustainable future for our young people. He encouraged the audience to consider how they can work on the levers, and in the environments that they are connected and close to, to release the pressure on people who are marginalized. Dr. Mahiri suggested that one way to do this is to push back on and resist the “normal” boxes that society attempts to put people in (which in academia is commonly referred to as “the practice of othering”) and resist easy definitions of identity so that the full range of human variation can be embraced. In schools, he says that moving beyond the “color-bind” can lead to a greater sense of belonging for students, a key factor in their ability to thrive and experience success..
Dr. Mahiri invited the audience to look into the Othering & Belonging Conference organized by the Haas Institute for a Fair and Inclusive Society happening in Oakland in April.